Bush Lodge has long been known as a premier safari destination. Over the years the lodge has been evolving, renewing its exquisite African Style architecture and décor, rebuilding its guest accommodation to remain a magnificent luxury home in the bush. 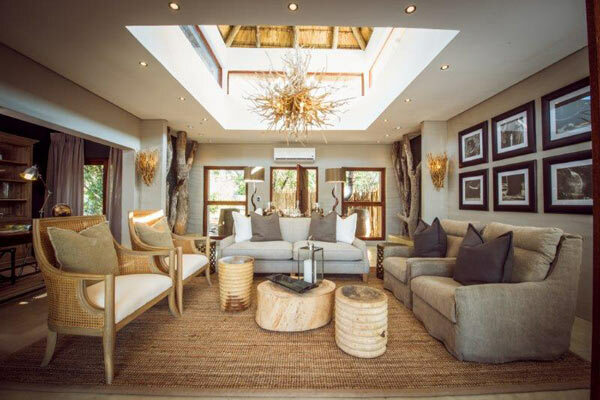 As an extension of the philosophy of providing the ultimate in luxury, Sabi Sabi is proud to unveil the Bush Lodge Luxury Villas – lavish accommodation which includes 2 bedrooms, 2 full bathrooms, lounge, library, dressing room, patio and pool. The two new Luxury Villas will become available next month, offering the epitome of opulence, space and magnificent design. The Villas are extraordinarily expansive, architecturally interesting and beautifully decorated in the eclectic Bush Lodge style. 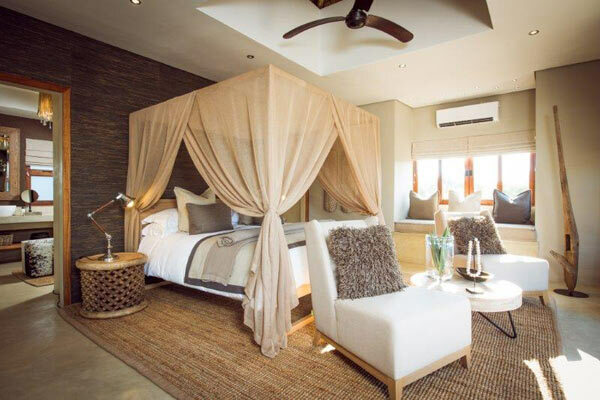 Every detail of the new suites has been carefully planned to make guests feel spoiled and at one with the bushveld, while enjoying the highest standard of accommodation and service. They are indeed a superlative base for a memorable safari. Within each suite a huge master bedroom with king size draped four-poster bed leads into a dressing area furnished with hide covered chairs and ottomans. A little further and one steps into a truly unique, palatial, floor to ceiling glass walled bathroom. The two enormous side-by-side baths have sliding windows opening to the outdoors. 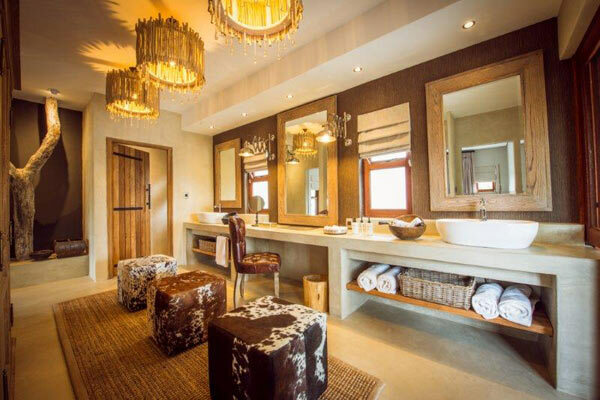 His and hers vanities, armchairs and an open ‘rain’ shower complete this incomparable room. But there is even more: an outside al-fresco shower, almost invisible, tucked away in an indigenous tree. The second bedroom is also beautiful, with twin draped beds and comfortable cushioned window box seating to relax and watch the great outdoors. This bedroom features another private en-suite bathroom, which includes a bath and rain shower. The suite has a sizeable, wonderfully furnished lounge/library, with beautiful chairs and couches upholstered in the calm, muted colours of the bushveld. In this room, as well as throughout the suite, there are a myriad interesting details and textures: raw grass wallpaper, smooth floor finishes, leadwood sculptures mirroring the natural environment, sisal rugs. Look up and there are fascinating chandeliers handmade from salvaged sticks, branches and twigs, with interspersed twinkling light bulbs. 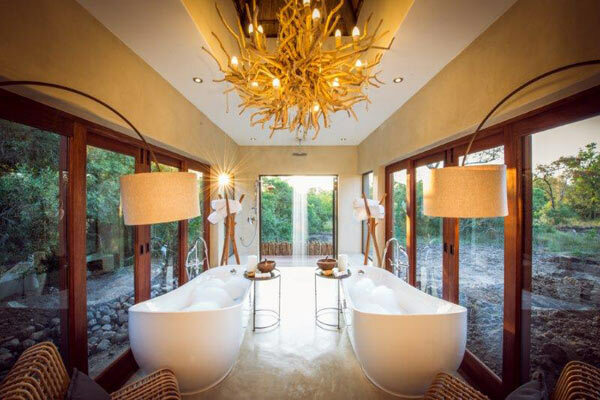 Both bedrooms and the lounge open out onto a huge reed-covered patio, which includes a private plunge pool. With upholstered lounging chairs and couches the patios are a wonderful addition to the amenities of the suites. Besides the wonderful in-suite conveniences which one expects in every Sabi Sabi suite, guests staying in the Luxury Villas have their own private game vehicle, ranger and tracker. This is exclusivity and luxury at its idyllic best.